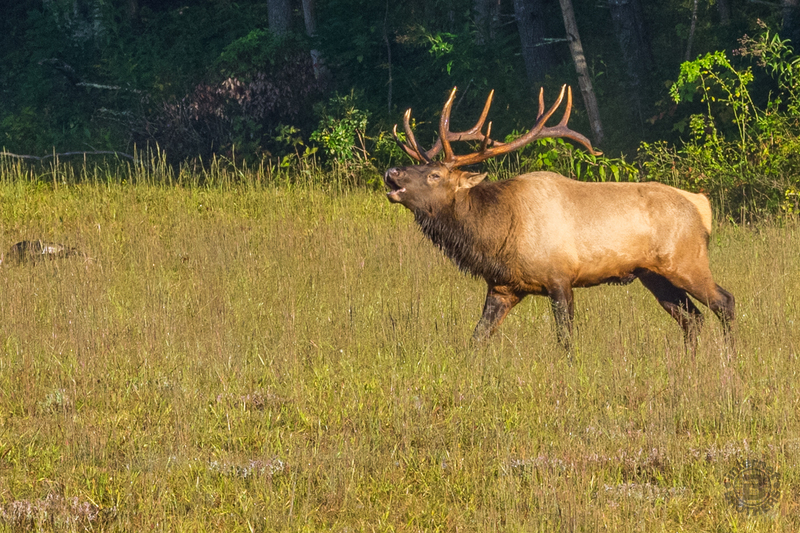 Late September is an exciting time in Cataloochee Valley as the elk herd begins their annual mating dance ritual known as the rut. Cows, calves and yearlings live in loose herds or groups throughout most of the year, and are seen wandering the vast meadows of the valley all spring and summer. The bulls, however, live in bachelor groups or alone. It is rare to happen upon a bull off season. During the rut, cows and calves form harems with one or two mature bulls. At this time of early fall, people come from far and wide to this corner of the Smokies to witness this breeding season. Bulls gather cows and calves into small groups, protecting them from other bulls. The big boys will wallow in mud to coat themselves with urine “perfume” to attract their favorite cows. They also bugle and rub trees, shrubs and the ground with their antlers to attract cows and intimidate other bulls, aggressively guarding their harems, at times in violent battle. If you’ve never heard a bull elk bugle, it is like no other sound. At Cataloochee Valley the bugling of the bulls echoes through the basin, being heard from a mile or more away. I made my most recent visit to this eastern corner of Great Smoky Mountains National Park, arriving about 6:30 AM. I nearly had the valley to myself, as I only saw one other at this twilight time a half hour before dawn. I immediately headed for the far western end of Cataloochee Road at the Rough Fork trailhead to setup my tripod and wait. Wait for the sunrise, and wait for the show. Right off the bat I was not disappointed. There were two very young bulls laying in the grass only about 50 yards from my location. As the sun began to announce its presence at the other end of the fog shrouded valley, these youngsters stood up and stretched, then commenced grazing on the abundant blessing that fills the Cataloochee meadows. For the next hour I watched as turkeys came out of the woods to stick their snouts in the plentiful fields, ravens flittered about alerting the valley residents to the dawning of a brand new day, and headlights announced the arrival of additional gawkers. Then it began. That unmistakable sound. Through my telephoto lens I could see his silhouette at the other end of the meadow. That’s the picture above. This was one of the big ‘uns. Then to my great pleasure this giant bull drove his harem directly toward my location. As the rising sun struck the verdant field with its golden glow, the magnificent bull brought his show right to my end of the valley. His bugling was vigorous and piercing — his harem totally obedient. The two young bucks gave him plenty of room as he strutted past and into the woods. When he was safely gone, the younguns engaged in a playful jousting match, locking antlers and twisting their bodies to and fro. It was captivating. After standing in 46° for more than two hours, I was ready to warm up. So I loaded up my pack and hit the Rough Fork Trail to Woody House, a nineteenth century dwelling that reminds us of the endearing history of the Smokies. The forest was alive, as was I with this very exciting morning at Cataloochee Valley. 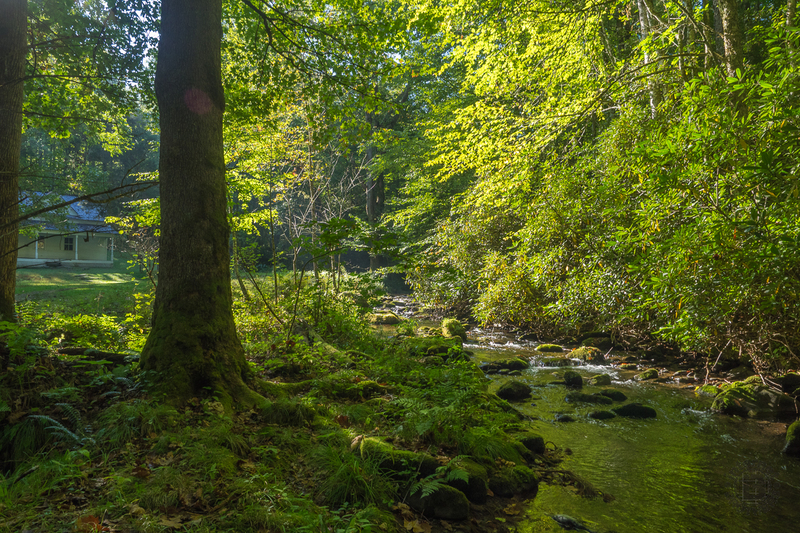 I hope you enjoy these new photos from Cataloochee Valley as much as I enjoyed the day. There are two galleries below, one of the elk, and the other of my excursion to Woody House. Feel free to leave your comments below the galleries. One of Cataloochee’s finest, this magnificent creature lets everyone in the valley know that he is the lord over this domain. Imagine awakening in Woody House each morning to this enchanting scene. Living was hard in 19th century Cataloochee, especially in winter, but the rewards were invigorating. Update September 22, 2016: Time for another pre-dawn visit to Cataloochee Valley during elk rut season. Unfortunately, on this particular day the elk decided not to cooperate. They melted into the forest just a matter of minutes after the first morning light. Still, it was a beautiful day in the valley. Update September 26, 2017: For the first time, this year I went to see the elk in the evening. I arrived in the valley about 2:30 in the afternoon, setup camp, went for a hike on Rough Fork Trail, then came back to the fields about 5:30 and waited. As usual, it was definitely worth the wait. Staying at the campground made it possible for me to get back out there at dawn again, then have the whole day for another hike. Here is a new set of photos. Please feel free to leave your thoughts and comments below.